For the women, Wimbledon may be more open now compared to the last few years. Usually, the easy bet would be to go with Serena Williams, she of the Wimbledon and 17 Grand Slam titles. But given her early losses in the previous two Slams, the world number one is no longer a sure bet. With Maria Sharapova back in form following her French Open victory, the return of Victoria Azarenka from injury, and the rise of a promising youth brigade (led by Simona Halep), a Serena triumph is no longer a given. Will the trend continue over the next two weeks, or can Serena restore order? Let’s take a look at the women’s draw and predict the outcome. The world number one should be arriving at London with something to prove following her second round exit at the French Open. And we all know that in women’s tennis, nothing is more dangerous than a Serena Williams with something to prove. In 2012, after suffering a shocking first round defeat in Paris, she won both Wimbledon and the Olympics. Could we see a similar trend in 2014? There should be no letdown in the first three rounds (this is grass after all). In the fourth round she should expect to face either fast-rising youngster Eugenie Bouchard, or rejuvenated French Open semifinalist Andrea Petkovic. Bouchard, whose game reminds many of Maria Sharapova, has reached the semifinals of the previous two Slams would be the most likely fourth round opponent. Speaking of Sharapova, the French Open champion is the other top seed in this group. The fifth seed is seeking her second Wimbledon title, ten years since winning her first. She actually seems to have an easier path to the quarterfinals than Williams, with ninth seed Angelique Kerber (a finalist at Eastbourne last week) her top threat. Sharapova was slated to meet Serena in the quarterfinals of the French, and given that the Russian has lost their last 15 meetings, will be hoping for a fortunate break at Wimbledon as well. Simona Halep proved at the French Open that not only can she handle the pressure of being one of the top seeds in a Grand Slam, but she is going to be a major threat for years to come. It is difficult to envision the Romanian not winning a couple of Slams in her career. She has the game (movement and shot-making, though not necessarily the power) to do well on grass, but the third seed has never made it past the second at Wimbledon in her young career. This year, the assumption is she will go even further, especially given her draw. The highest seed in her half is Carla Suarez Navarro, whose game translates better on clay than on grass. The top two seeds of the opposite side of this section, are Serbians Jelena Jankovic (seventh seed) and Ana Ivanovic (eleventh seed). Ivanovic won her grass-court tune-up in Birmingham last week so she would be the more confident of the two. However there is one player lurking who should scare everyone in this part of the draw, and that is Sabine Lisicki. Last year’s runner-up has the game perfectly suited for the grass, with her big groundstrokes and even bigger serve. She always seem to do well in London, and it would not be a surprise if the Wimbledon specialist is the winner of this quarter. Radwanska has made the final and the semis at Wimbledon the two previous years. Despite her lack of power, the fourth seed has the movement and the touch whuch makes her a dangerous player on grass. She should be expecting to make another deep run this year given her draw. It seems awfully similar to the draw that Halep – the next highest seed in Radwanska’s half is Sara Errani, who like Suarez Navarro, is a clay-court specialist. The top seed in the opposite side of this section is eighth seed Victoria Azarenka. Azarenka has always done well at Wimbledon, but having been off the WTA Tour for so long due to a foot injury one has to wonder about her match fitness (Vika has played just one match the last three months). Perhaps tenth seed Dominika Cibulkova would be the player to watch in that part of the draw rather than the Belarusian. Since making the final of the Australian Open, it’s been a bit of a struggle for Cibulkova. But her aggressive style of play should be rewarded on grass and the fact that she has more matches under her belt than Azaranka should not be overlooked. Perhaps the quarter where upsets are more probable is this one right here. The top two seeds here are Li Na (second seed) and Petra Kvitova (sixth seed), players who are as capable of losing in the first round as they are of winning the entire tournament. Li Na started 2014 by winning the Australian Open and at one point was even closing in on the world number one ranking. But it’s been a roller coaster ever since, and one has to wonder what her confidence is like coming into Wimbledon after a first-round upset at the French. She should expect to do better on a surface that will reward her style of tennis. Her fourth round opponent could be Australian Samantha Stosur, whose game seems made for grass but has not had the success to match (frankly, it’s been disappointing) or the light-hitting but steady Caroline Wozniacki. Kvitova’s path seem a bit more trickier to navigate. She could face five-time champion Venus Williams in the third round (although Venus have not gone past the second round of a Slam in quite some time) and then either twelfth seed Flavia Pennetta (Indian Wells champion) or Sloane Stephens in the fourth round, with a nod towards the young American who has a knack for playing her best tennis at the Slams. Lisicki took out Williams on Centre Court at Wimbledon in the fourth round one year ago, so payback will be on Serena’s agenda for this one. Again, the only thing worse than a healthy Serena if you’re an opponent is a Serena with a chip on her shoulder. This is where the athleticism of the world number one will help see her through. It all depends on which Petra Kvitova shows up. If she’s on top of her game, she can just blow away Radwanska with her power tennis. If she’s sloppy, she can pile on the unforced errors and giftwrap the match to her opponent. Given that she’s in the semifinals, the 2011 Wimbledon champion should be very confident in this one. Expecting to see good Kvitova here. Kvitova, when her game is right, is the only player capable of defeating an in-form Serena (Lisicki being the other). Nerves should not come into play either for the Czech player – she’s already won here in 2011. But Serena has won here three of the past five years and does not make a habit of losing in Grand Slam finals, particularly here (she’s lost just two – to Sharapova and big sister Venus). 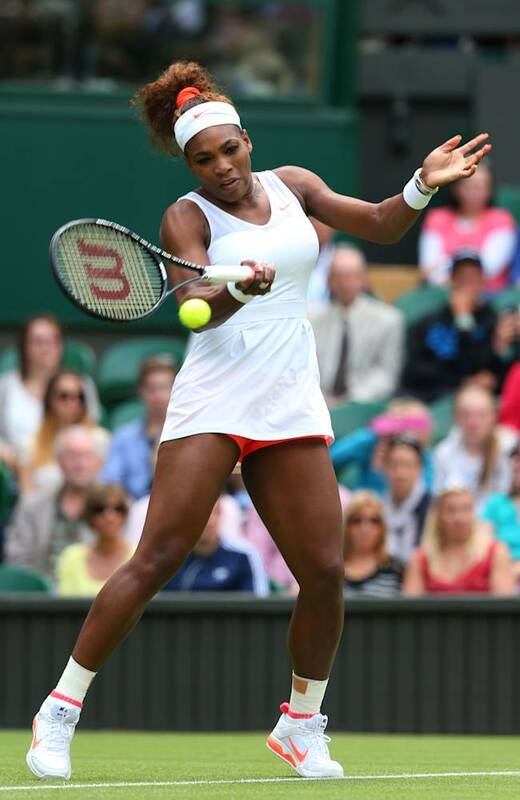 Look for Serena to emerge victorious in a three-set encounter. It could be the start of a big summer for the world’s number one. Who will be the 2014 Wimbledon ladies' singles champion?